Born in village of madhubani district. Our grandmother got married at a very tender age of twelve to shri Basudeo jha of Satlakha village of madhubani district. They had five children. Our grandfather passed away very young. Our father was just five year old at that particular time. Every one in her village called her “BAI”, with respect. She was like mother Teresa of her village. She herself saw very difficult phases in her life, as bringing up five children, especially three girls with literally no source of money was a Herculean task. Very soon her elder son Nagesh started working at the age of seventeen. One of our memories of our grandmother, which is very strong in our mind is that whole day there was something cooking in the “ Bhansa ghar”(kitchen). IT was a regular practice that whoever visited her could not go before having full meal. Along with her daily rituals, she used to make kohbar, pauti-mauni (boxes prepared through reed), janeo, (the sacred thread which all Brahmins wear). Although we were all very small at that particular time but she had done all preparations of my wedding. She had an ardent desire of seeing my wedding but at the same time she was quiet modern to think that education was very important for us. Our grand mother never wore stitched clothes in her life. Till the last moment in her life she kept working and painting all the mud walls of our house on different occasions like Diwali, Dushera etc. Dr. Umeshwar Jha was well known doctor of Saharsa District. He was a gold medallist from Patna Medical College. He was married to Kumud jha of Nehra village. Kumud was just 12 year old when she got married. They had ten children out of which six girls and two sons survived. After getting all his daughters married they settled in Chattapur. 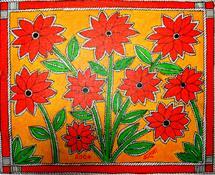 Along with her artistic skills, Kumud had great agricultural skills and after her husbands death she took it as a profession. 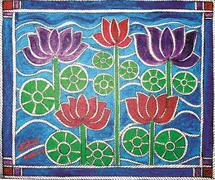 She is very good in painting, sujni making, reed work, path work and silk embroidery. 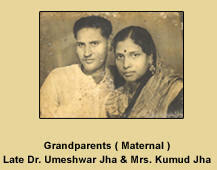 Dr. Umeshwar jha passed away in 1987. Smt. Kumud Jha is still living in Chattapur and Kamat (A small village of Saharsa district). Born in Satlakha village of Madhubani District in the year 1944. 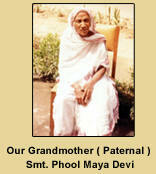 He was fourth child of Mrs. Phool Maya Devi. He was very hard working since his childhood. He was called “Boodbhai”(old brother) among all the villagers, as he was a very responsible child. He studied in “lohakapsiha” school, which was almost ten kilometers away from his village. All the boys used to walk to their school, crossing few streams on the way. It used to be very bad during the monsoon season. After his schooling he came to Delhi barefoot, with dreams of doing something very big. His brother wanted him to do some clerical job but he wanted to study further and join something different which had more opportunities in life. It was at this particular time that he joined five years course in Architecture. He used to work during daytime and attend Night College. Along with his Architecture he mastered the art of yogasna under swami Dhirendra Brahmachari. 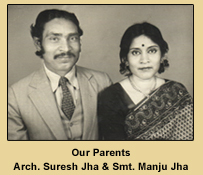 After completion of third year of Architecture he got married to Manju in the year 1965. By the time he finished his Architecture all three of us were born. He started his own practice in Delhi without telling his wife that he had left his job. Slowly with lots of hard work he established himself in the field of Architecture and opened a firm called “Architechno”. Today he is one of the most established architects of Delhi who specializes in-group housing societies, institutional buildings, banks and residences and temples. His passion for learning is never ending. Even today apart from his Architecture he continues to learn Sanskrit at and has cleared two three levels of exams. He is also very active in his architectural works, which are in Delhi and Vrindavan. He is the most supportive and inspiring father. 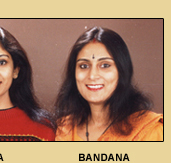 As he always says, “I wish I had three more daughters, as talented as Manisha, Bandana and Puja”. Born in 1949, in Nehra village, of Madhubani District. 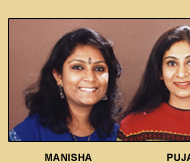 Manju is the eldest, out of eight children of Dr. Umeshwar Jha and Mrs. Kumud Jha. Since her childhood Manju was quiet active in Music, Dance and ritual art. She did her schooling from Elars girl’s high school. She got married at the age of fourteen after which she completed her BSC. After finishing her graduation, she finally joined her husband in Delhi. Along with the daily household chores, which she did herself, she also used to take out blue prints in the office. In the initial years she was the only staff of her husbands office. Due to her hard work and ambitious nature all her daughters became Architects. Even today she is the column of the whole house without whom everybody feels lost in her family. She kept the tradition of Mithilanchal totally alive in her house and has passed the strong tradition of maithil culture in her three daughters. Today she is not only helping her husband and daughters in their profession, she has very successfully imbibed maithil culture in her grand children. 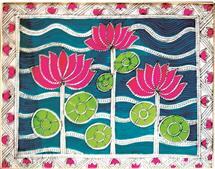 Mrs. Manju Jha is working in Architechno Corporation and is very actively practicing Madhubani paintings.